Its about that time again when people start lighting their homes and Christmas trees for the Christmas season. If you use a lot of lights then the electricity consumption can add up to quite a bit. The display at Komar.org for 2004 had 17,000 lights and cost him $150 in electricity for the season. That Komar display is also used to raise money for Celiac disease research. The Komar display is similar to the home pictured, but not the same house. You can see pictures of the Komar display at their site. Of course most of us don't have thousands of lights on our homes like they do but we may have a few hundred outside and some more on the tree inside. The energy consumption adds up. Lets say you have your Christmas lights up and in operation for 60 days around Christmas. If you run the lights all night then you might turn them on at 5PM and then turn them off at 8AM. That would be 900 hours of operation. For example lets say you use three of : Set Of 200 Clear Christmas Icicle Lights By GE - White Wire (purchased for $7) This string uses 67 Watts. If you light this set for 900 hours then that would amount to 900 hrs x 67 W = 60.3 kWh per string With electricity cost of $0.10 per kWh that would equal $6.03 electricity usage for a single string of lights. The total electricity bill to light a house all night for 60 days with these lights would be $18.09 for the season. With a larger house or more elaborate lighting display you could end up using more electricity. There are a few ways to cut the cost of electricity. For the example above I assumed that the lights would be turned on for 60 days. But you could limit your usage to 30 days instead. This would directly cut your costs in half. Lighting your outdoor Christmas lights for 30 days instead of 60 days would save $9.04 compared to the example above. If you turn your lights on at the evening and then leave them on at night when you go to bed then you're really wasting the electricity that you use at night. Nobody needs to see the lights at 3AM. If you turn the lights off at Midnight instead of leaving them on all night then that would cut your usage to 7 hours a day instead of 15. That would reduce the usage to 420 hours instead of 900 hours. This alone would cut your electricity usage by 54%. With the example above your cost would go down from $18 to $8.4. Thats a savings of $9.60 per year for simply turning the lights off late at night. With a savings of $9.60 for turning the lights off compared to not doing so you could pay for the timer in a single year. Lighting for 30 days instead of 60 will cut your bill in half. Turning off the lights at night will also roughly cut your bill in half. If you combine both of these then you'll cut the bill down to 1/4. If you operate the lights from 5PM to Midnight for 30 days you would have 7 hours a Day for 210 hours of usage for the season. At 67 Watts this would be 14 kWh or about $1.40 electricity per string. So for the 3 strings this would be a total cost of $4.22. Turning your lights off at night and lighting them for half the days would save $13.86. Now the above suggestions are easy and straight forward ways to save on the electric bill. But many people enjoy using their holiday lights for more days so cutting back on usage would not be something they prefer to do. There are other ways to save on energy by using more efficient lighting. If your lights are the style that blink on and off then they will be off part of the time. They will probably be off 25-50% of the time. Since the lights are off more of the time they will not use as much electricity. Blinking lights could save you 25-50% of the electricity used by lights that are on all the time. LED lights use a lot less energy than an incandescent bulb. The LED bulbs work pretty good for Christmas lights. Another bonus of LED lights is that they last much longer than incandescents so you won't have to worry as much about replacing burned out bulbs. You can buy a UL 200 Count LED Multi Color Icicle Lights for $28 and they use 19.2W. If you used 3 strings of these LED icicle lights and ran them 900 hours like the original example then it would use 900 h x 19.2W x 3 = 51.84 kWh for a cost of $5.18. Thats $12.91 less than the normal lights. Since the LED lights are $28 a string and the normal lights were $7 each, buying 3 strings of LED lights would cost $21 x 3 = $63 more. So with an extra cost of $63 and a savings of $12.91 then it is about a 5 year payback period for the extra cost of LED lights. This is just one example. The savings could be more. In fact according to the Dept. of Energy: "If you run Christmas lights on your tree for 12 hours a day for 40 days with traditional incandescent Christmas lights, you’d pay $23.95 in electricity. With LEDs, you’d only pay $0.54 for the whole 40-day period. If every home in the U.S. switched to LED holiday lights, we could save $160 million in energy costs this season alone." If you're in a region that gets a decent amount of light during the winter months then a set of solar powered Christmas lights might work well. You can buy SOLAR POWERED CHRISTMAS LIGHTS for $20. That string gives you 60 lights. The icicle lights use 67 Watts for 200 lights so that's 0.335 Watts per bulb. If you bought a string of normal lights with 60 bulbs then they would use about 20 Watts. Over a 900 hour season that string of bulbs would use 18 kWh or about $1.80 in electricity more than the solar set. A standard string of lights would probably cost you $4-8 so the increased cost of the solar set would be $12-16. The payback period for the solar lights would be around 7-9 years. Don't overlook the energy use of the lights on your Christmas tree. Some of the larger incandescent bulbs on Christmas tree lamps can use a lot of electricity. A string string of the large C7 size Christmas tree lights can use a lot of energy. Each of the bulbs takes about 5 Watts. So a string of 25 lights would use up 125 Watts. If you run your lights 12 hours a day for 60 days then that would be 720 hours. One string of C7 bulbs would use 90 kWh or about $9 in electricity for a season. You can buy a string of C7 lights that use LED bulbs. The LED bulbs only take about 1W each. LED C7 tree lights would cut the cost 80% for an electricity savings $7.20 per year. 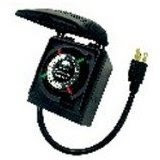 The LED lights like these: GKI/Bethlehem Lighting Indoor/Outdoor LED 25 Multi-Color Light Set, Green Cord cost $20. 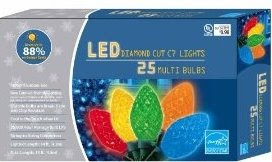 The normal lights such as : 25 Count UL LED Diamond C7 Light SET - Multi are $8. So the LED lights cost $12 more and save $2.40 per year. Again this is about a 2 year payback period for the extra cost of the LED lights.